These beautifully made shoes from Hooves are a brand new vegan-friendly design that break the stereotypes of boring ethical footwear. The London-based studio, lead by Mark Bryceland, specialise in non-leather shoes for both men and women. 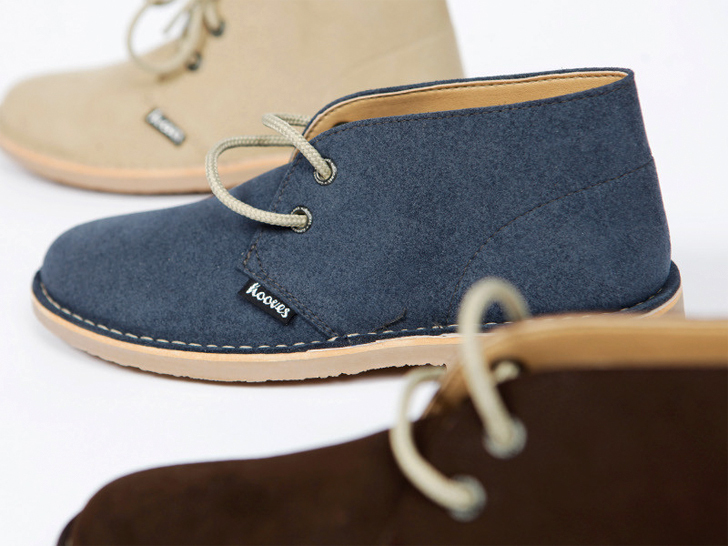 Hooves designs are more than just elegant shoes; as they have been made ethically and sustainably, they come with peace of mind. Currently running an exciting Kickstarter campaign, the studio is just a few days away from their target, already making waves with their simple stylish footwear. Mark told Ecouterre that as a vegan himself, he wanted to promote the use of cruelty free and more environmentally sustainable footwear alternatives. “I want to challenge the perception that non-leather shoes are somehow inferior in quality and less durable than leather and suede,” he said, making sure that the sustainable designs have a high level of aesthetic appeal. The designs are made with high quality alternatives: microfibre lining and upper, and soles from TPR Rubber. These materials, Mark says, are breathable, eco-friendly and biodegradable, making them a viable option for ethical consumers. Aesthetically the shoes are simple and cool flat ankle boots, cut in a style that is durable in the fashion world. Take a look at their Kickstarter page or website for more details of the designs.